El Sira Communal Reserve is home to several indigenous groups, as well as endangered species found nowhere else. Located in central Peru’s Amazon rainforest, El Sira is surrounded by deforestation for cropland, cattle pasture, and gold mining. A recent analysis finds that these activities have invaded the northern portion of El Sira reserve, with 1,600 hectares of forest cleared since 2013. Satellite data indicate this may be a growing trend, with far more tree cover loss recorded in September 2016 than during September 2015. Deforestation is pressing further into a protected area in central Peru, finds a recent analysis by the Monitoring the Andean Amazon Project (MAAP). Satellite data and images show areas of clearing for crops, cattle pasture, and gold mining within the bounds of El Sira Communal Reserve, an important area for indigenous groups and several endangered animals. El Sira Communal Reserve is a Delaware-size protected area in Peru’s beleaguered central Amazon. Its dense rainforests provide a home for an array of wildlife, such as jaguars (Panthera onca), giant otters (Pteronura brasiliensis), and black-streaked puffbirds (Malacoptila fulvogularis). Among its fauna are endemic species found nowhere else in the world. These include a species of beaked toad called Rhinella nesiotes, Maria’s giant glass frog (Cochranella mariae), and a monkey frog (Phyllomedusa baltea) – all considered Endangered by the IUCN. The reserve also contains the only known population of the critically endangered Sira currasow (Pauxi koepckeae), a large black-and-white ground bird with a striking blue “helmet” of feathers and red beak. Scientists think there may be fewer 400 Sira curassows left in the world today. El Sira Communal Reserve is also home to around 30,000 people of Ashaninka, Shipibo-Conibo, and Yanesha indigenous groups, many of whom depend on forest resources. At the behest of both local communities and biologists, El Sira became an official communal reserve in 2001, a status that its enactors hoped would confer protection of its forests and wildlife. However, data collected by satellites indicate El Sira may not be as protected as its designation implies. 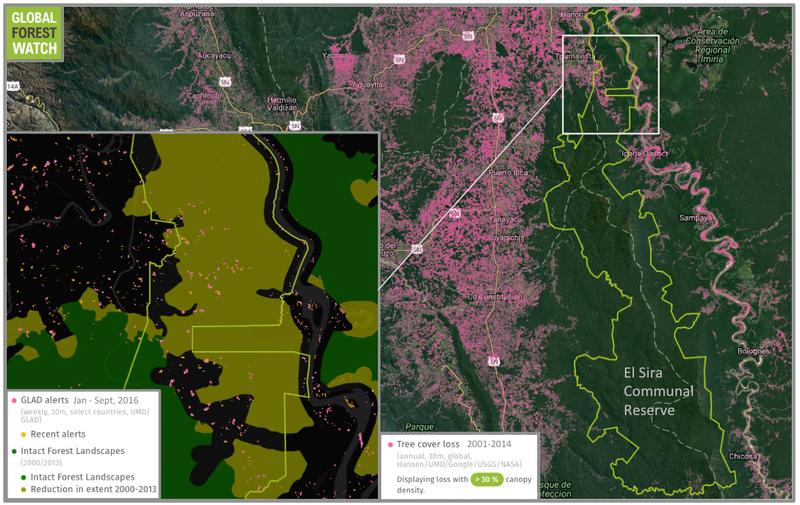 Analysts with MAAP – a project of the Amazon Conservation Project – found several pockets of deforestation within the bounds of the reserve. They attribute this primarily to clearing for cropland, gold mining, and cattle pasture. The latter, they write, is of particular concern, as it is especially rife in this part of Peru. In a previous analysis, they found that conversion for cattle pasture led to the deforestation of an area of rainforest the size of Connecticut in 15 years. 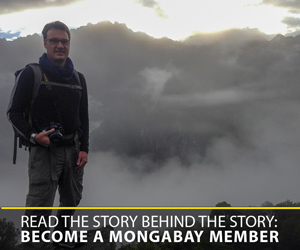 “It is likely that cattle ranching has been the driver in that part of the country for awhile, just no one really documented it,” said Matt Finer, a researcher with the Amazon Conservation Association, in a previous interview with Mongabay. He called central Peru’s Amazon an “under-appreciated area,” when it came to conservation attention. 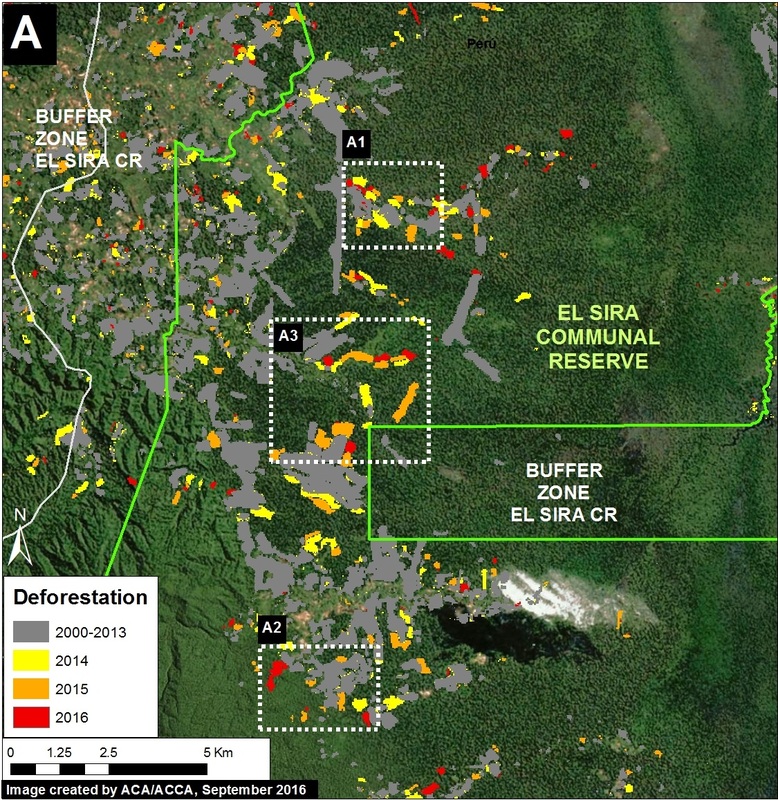 In this most recent study, Finer and his colleagues used high-resolution satellite imagery and data to shine a light on specific areas of El Sira. They found that three portions of the northern part of the reserve have been particularly hard-hit by deforestation in recent years, with 1,600 hectares of forest lost since 2013 – equivalent to about 2,200 soccer fields. Of that, 285 hectares were lost from January to late August, 2016. Data from the University of Maryland indicates this may be a rising trend. Their Global Land Analysis and Discovery (GLAD) dataset shows 488 tree cover loss alerts were recorded between September 9 and 23, 2015. That number jumped to 3,197 during the same time period in 2016. The forest monitoring platform Global Forest Watch shows much of the forest loss identified by MAAP and GLAD occurred in areas that was occupied by particularly large, continuous tract of primary forest called Intact Forest Landscapes (IFL) in 2000. However, this IFL has since degraded. The MAAP researchers also profile gold mining in their analysis, but say it’s of less concern for this area than agricultural expansion because of regular government crackdowns. Their imagery shows areas where mining operations have been abandoned and the forest is starting to grow back. However, illegal gold mining is still a problem in the region – as it is in many other parts of Peru – and the team did find areas of recent and continued mining activity. 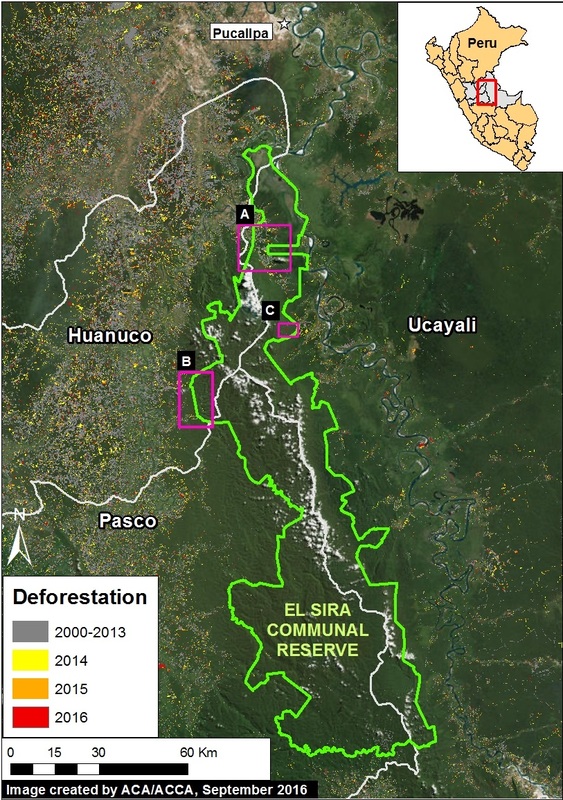 El Sira Communal Reserve has acted somewhat like an island in a sea of deforestation, but the recent MAAP analysis indicates it is not completely immune from conversion pressure.